Diesel demand from cars and commercial vehicles in the UK has pushed above 2.5 billion litres for the first time ever, according to the AA. But petrol consumption by UK drivers is increasing more slowly despite falling pump prices – up only 19 million litres or just 1.3% last month. Official figures show that iin November, UK drivers used 1.498 billion litres of petrol, compared to 1.479 billion in October. Petrol prices in November fell from around 124p a litre to 122p, nearly 10p a litre below the summer high of 131.70p in June. A year ago, when November petrol prices averaged 130.4p a litre, motorists got through 1.523 billion litres, latest figures from HM Revenue and Customs reveal. So, despite lower prices in 2014, petrol consumption has fallen. November's diesel sales set a new record of 2.501 billion litres, up 144 million litres or 6.1% compared to October (2.357bn ltrs) and 64 million litres higher than in November 2013 (2.437bn ltrs). 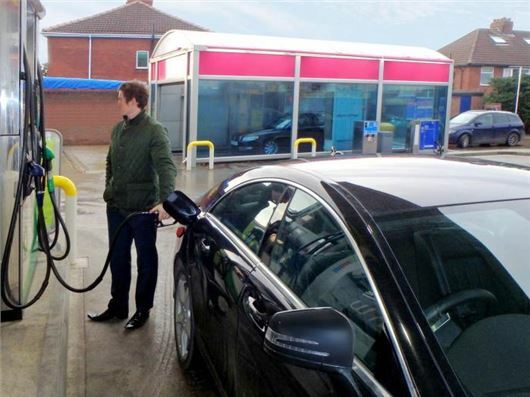 Diesel pump prices fell from 128p a litre at the start of November 2014 to 126p by the end. This compares with an average of 137.8p in November 2013. Department for Transport statistics reveal that in the third quarter of 2014 car traffic rose 0.6% compared to the previous quarter. However, HGV traffic was up 1.1% and light goods vehicles were up 2.9%. Car and HGV activity remains below late 2009 levels, while light goods vehicles (LGV) levels are 12.6% higher than in the third quarter of 2009. The number of petrol cars fell by only 1.5% (288,500) in 2013 compared to 2012, while the diesel car population increased by more than 7% (679,000). “Once again, the official statistics illustrate the trauma of cripplingly high pump prices over recent years,” said AA president Edmund King. "In 2012, you could see the petrol consumption rise and fall in line with prices. Now consumption is struggling to get out of the rut created by drivers and families being forced long-term to adopt fuel-saving travel patterns to make ends meet. “It suggests that the savings from lower pump prices are being used to balance the books of family expenditure rather than increasing mileages. This points to the likelihood that much of the spare cash will find its way back to the high street.